Follow our easy, step-by-step, photo illustrated instructions to learn how to make these easy Golden Butter Cake layers. Just add the frosting of your choice. Printable recipe included. Golden Butter Cake will become your favorite recipe for making your basic cake layers. So easy to do, moist, and great for decorating. Cake is my favorite dessert of all time. I’ll take cake over pie any time, and this Golden Butter Cake with it’s yellow layers is super moist and very delicious. And, did I mention it’s so easy to make? You’ll need two bowls, one for the dry ingredients and one for the wet ingredients. 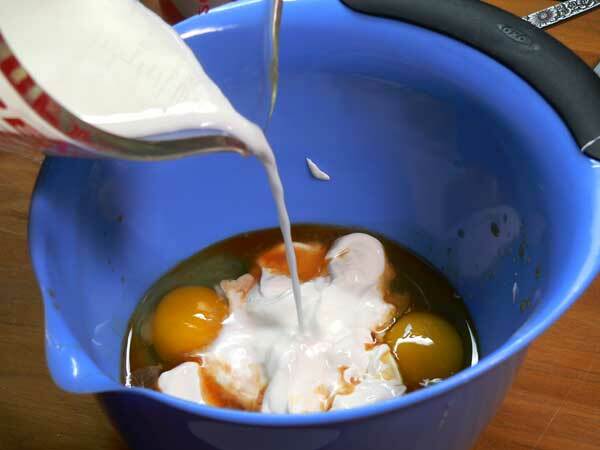 Mix each group together and whisk until fully combined, then add the wet ingredients into the dry and whip those together – by hand. No mixer is needed. How easy is that? Smile. I’ve just started using baking strips on my cake layers as I bake them. They’ve made a huge difference for me in the way my cakes look and I’m pretty certain I’ll be using them from now on. No more big domes in the middle of each layer that had to be cut off in order to stack the layers. Can’t argue with that now can we? Plus, these layers turned out really moist with the addition of the sour cream, but the texture was good and firm and held up well to my feeble attempts to frost and decorate the cake I’m making with these layers. You can frost these layers with your favorite frostings for a really quick and easy homemade dessert any old time. I made these to use with my Easter Bunny and Eggs Cake which you can see just as soon as I complete it. I decided to just do a separate post for making the layers so I can revert back to these in other recipes I hope to post here on Taste of Southern. Although I’ve always been interested in cake decorating, I’m not very good at it. I think I’m making some small improvements, but my hands just aren’t steady enough for all that intricate flower making and piping stuff that I see elsewhere. Mama never made pretty cakes, but she sure did make some really great tasting ones. I hope you’ll enjoy these for lots of your favorite occasions coming up. Let me know if you try it. Ready to bake some layers? Alright then, let’s head on out to the kitchen, and… Let’s Get Cooking. 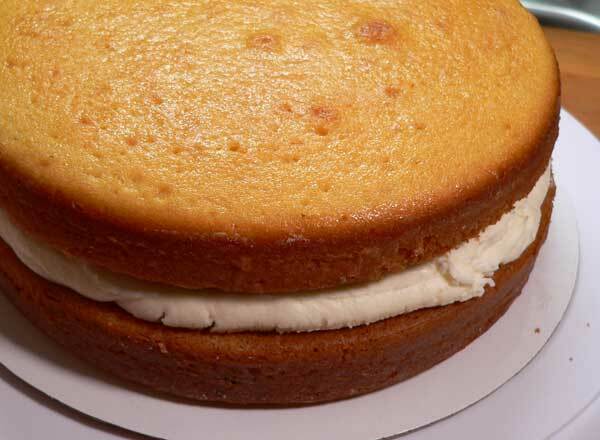 Golden Butter Cake Layers recipe – You’ll need these ingredients. Makes either 3 of the 6 inch layers or 2 of the 8 inch layers. 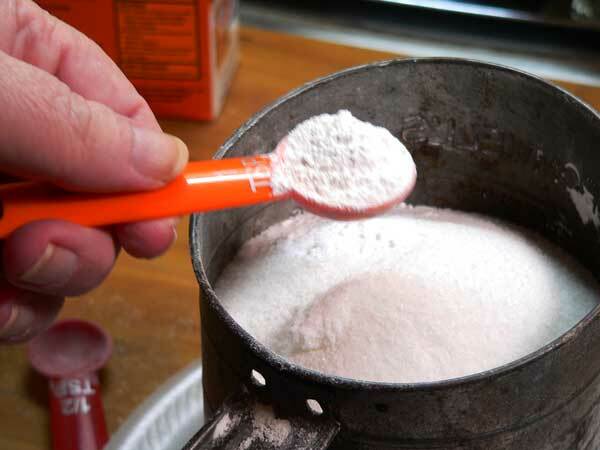 Add the flour to your sifter. 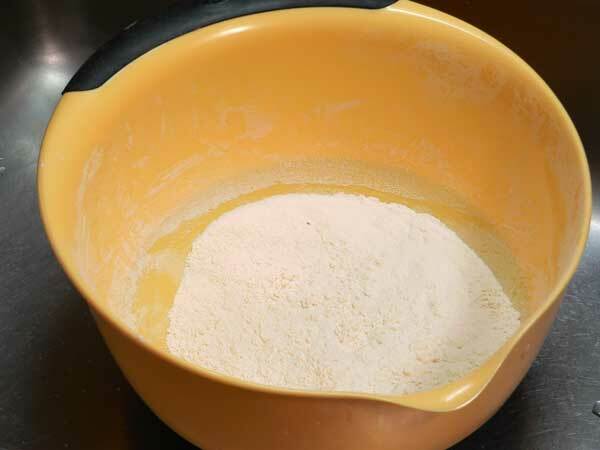 I keep my flour in a plastic container with a big wide open top. 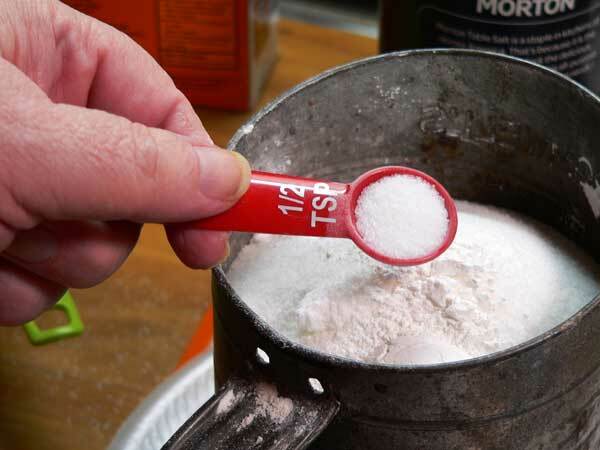 I always stir the flour up a bit to help aerate it, then I spoon the flour into my measuring cup, leveling off the top with the edge of a knife to have one level cup of flour. That’s then placed into my sifter to sift out any lumps and to aerate the flour even more. 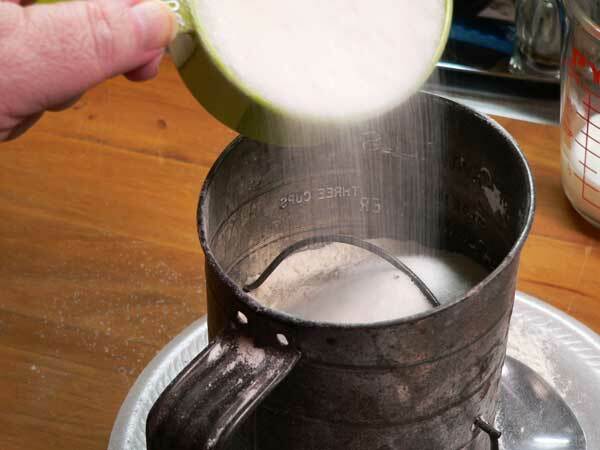 Pour the sugar right on top of the flour. Sift everything into a large mixing bowl. Set aside for the moment. 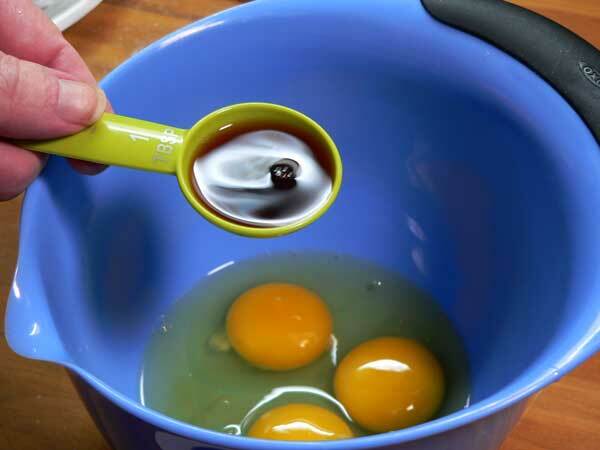 Grab a smaller bowl and add the three whole eggs. Add the sour cream next. Add the butter. It should be pretty much melted and cool so it doesn’t start to cook the eggs. 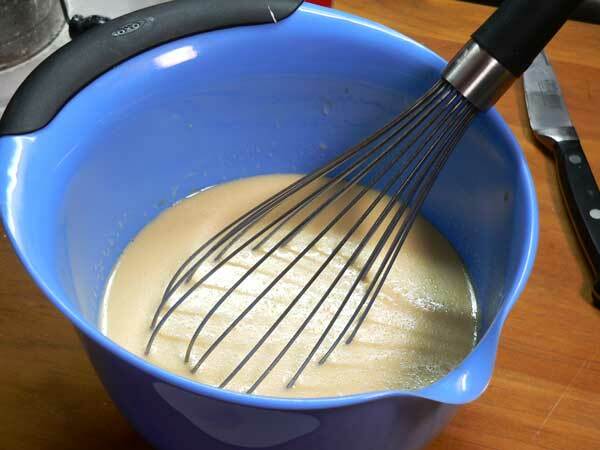 Grab your whisk and whisk all the ingredients together until fully combined. Whisk everything together until fully combined. Doesn’t take but a minute. I’m using two of the 8-inch cake pans to make my layers. It’s hard to tell by the photo, but I do use parchment paper in the bottoms of my pans. I rubbed some butter in the bottom of the pan, added the parchment paper, then buttered the top of the parchment paper and all around the sides of the pan. 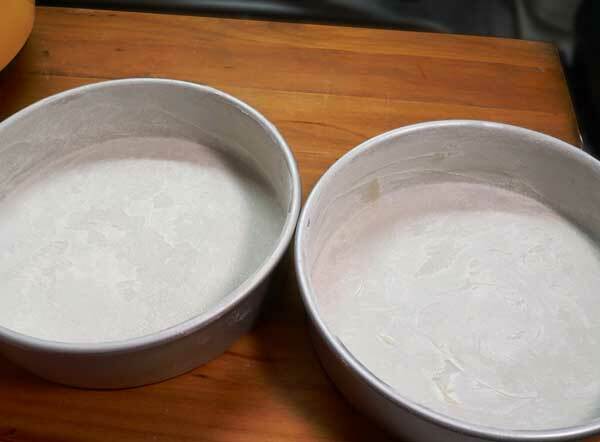 Next, I dropped a couple of Tablespoons of flour in the pans and then rolled the flour all around the sides and bottom until both were fully coated with flour. Then, I dumped out the excess flour, tapping the bottom of the pans until it just left a light coating of flour inside the pans. 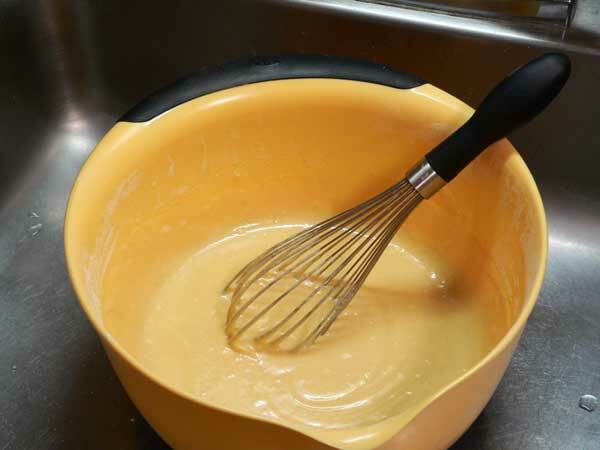 Divide the batter evenly between your pans. This is only the second time I’ve used these wet cloth wraps around the outside of the pans. It’s suppose to help the cake layers bake up without a big dome in the middle. You can buy these in many of the bigger stores that sell any type of cake supplies or online. You soak them in water for about 10 minutes, wring them out, then secure them around the outside of your pans just before placing them in the oven. Place the layers in your pre-heated oven and let them bake for 20-30 minutes or until done. Mine were ready in 20 minutes, but all ovens vary so you’ll just need to watch yours carefully. Layers are done when a toothpick inserted into the middle of the layers pulls out clean and free of any crumbs. You can also watch for the layers to pull away from the inside of the pan and be springy to the touch when you press on the center of the cake. When the layers are done, remove them from the oven and place on a wire rack to begin to cool. Can you see how the layer has pulled away from the inside of the pan? Smile. 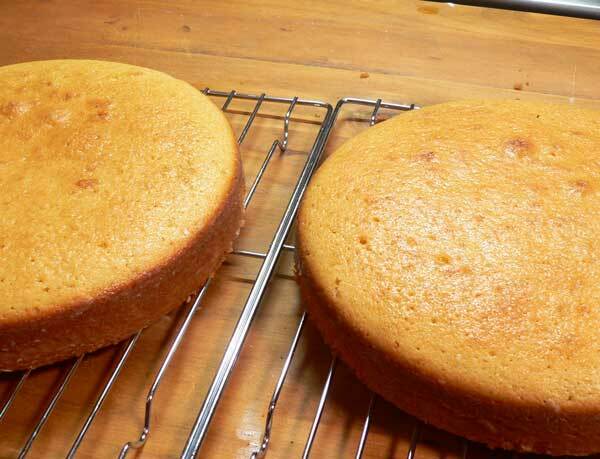 After 10 minutes, flip the layer out of the cake pan. Run a butter knife around the outside of the cake layer to be sure it’s loosened from the pan fully. Then, place the wire rack on top of the pan and flip everything over. The cake should easily drop out of the pan. If it doesn’t, try tapping around the bottom of the pan with the end of the butter knife to loosen it until it drops. I generally use my hands to flip the layers right side back up. You need to let the layers rest on the wire racks until they are completely cooled before trying to frost them. Aren’t they pretty? And, can you see how flat the tops are because of using the baking strips. I think I’m hooked on using those. No more trying to remove the tops to make a layer level. Smile. 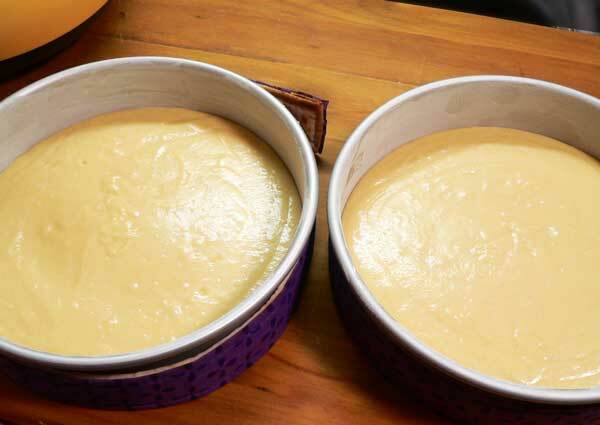 Once your layers are completely cooled, you can begin to assemble your cake. Just add the frosting of your choice and decorate as desired. I made these layers specifically to make my Easter Bunny & Eggs Cake for 2019. You can see that recipe next week. 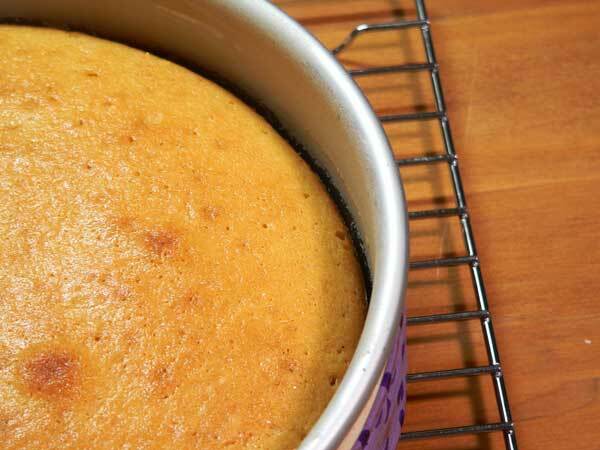 Delicious Golden Butter Cake layers are quick, easy, and super moist. 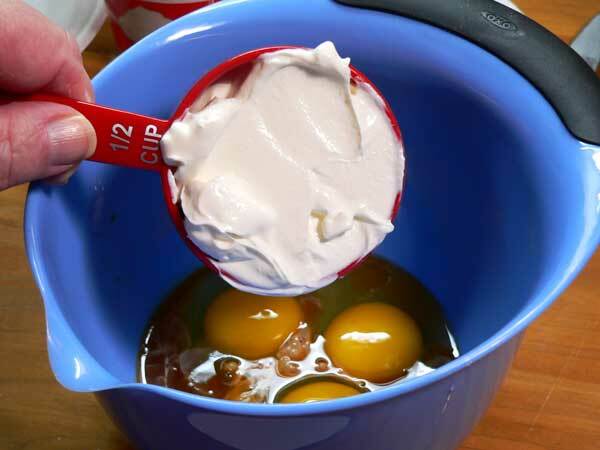 Great layers for making and decorating with your favorite frosting. 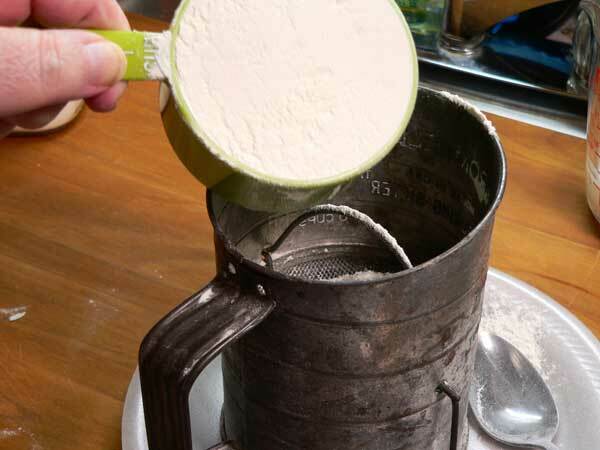 Place flour in a sifter. 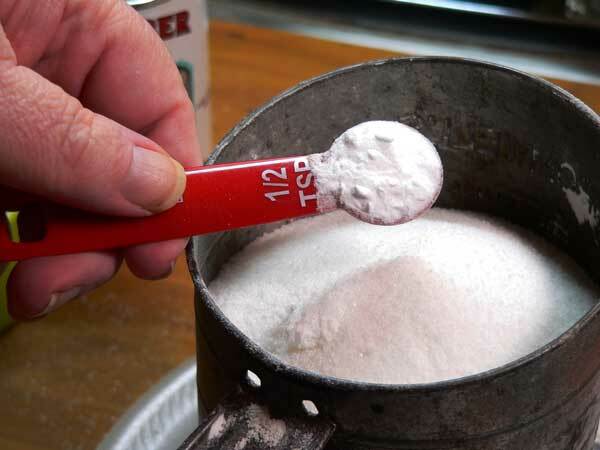 Sift dry ingredients into a large mixing bowl. Set aside for now. 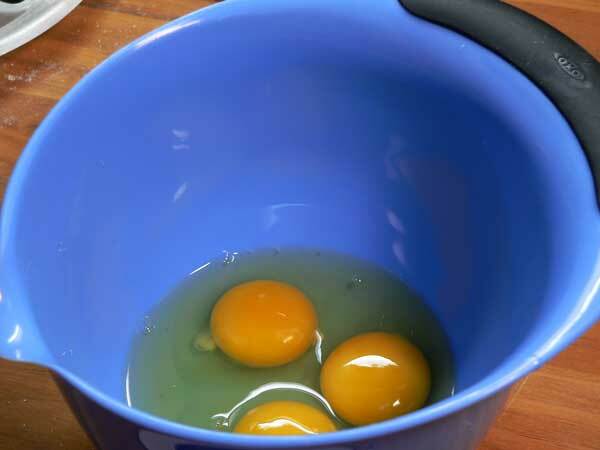 Place eggs in another medium sized mixing bowl. Beat the wet ingredients together. 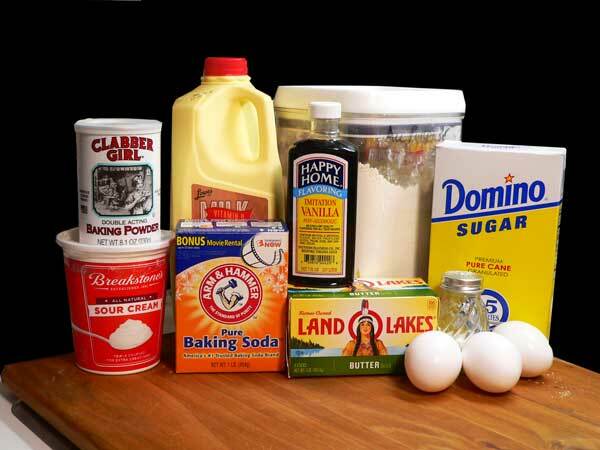 Whisk ingredients just until combined. Butter and flour your cake pans. 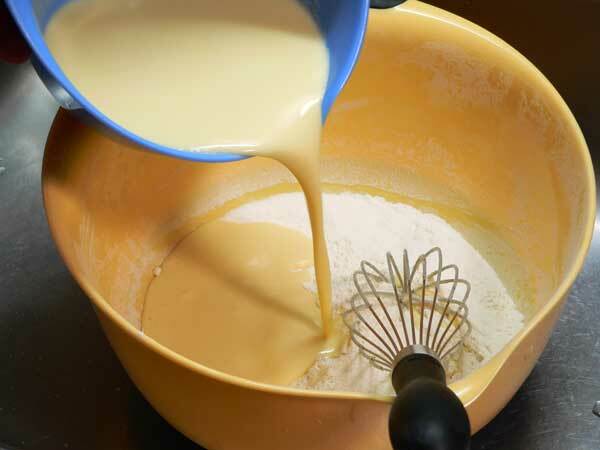 Divide batter evenly between the cake pans. Bake at 350F degrees for 20-30 minutes or until done. Remove from oven and place pans on wire rack. Let rest for 10 minutes. Flip layers out of pans and onto wire rack to completely cool. Makes 3 of the 6-inch layers, or 2 of the 8-inch layers. 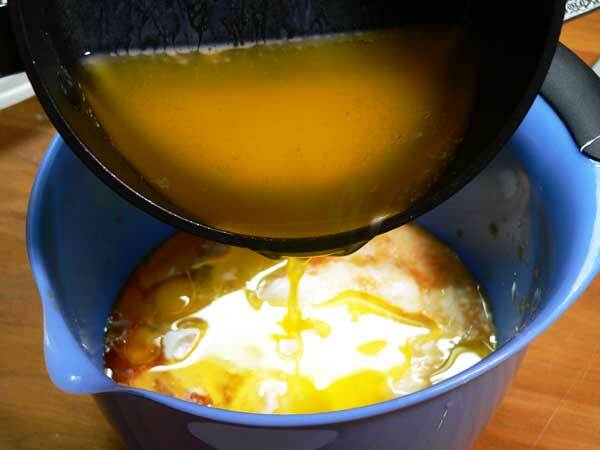 Recipe can be doubled if more layers or larger layers are needed. Ever tried this Golden Butter Cake layers recipe? How did you like it? 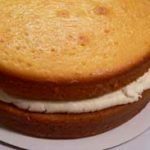 Or, maybe this: Basic Cake Layers – a more in depth look at making cake layers. I haven’t made a cake “from scratch” for so many years, I don’t even remember – except for occasional pound cakes. Boxes of cake mixes are getting smaller and smaller. 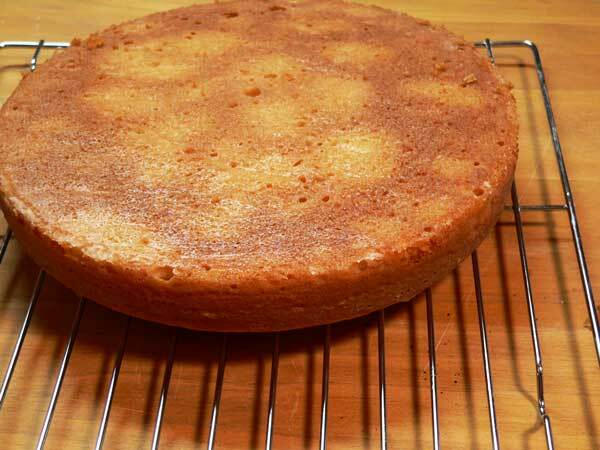 I always bake my cake mix cakes in a 9” x 13” pan because my layers always turned out uneven and humped in the middle. My decorating wasn’t too successful either, even though I took cake decorating lessons for six weeks long time ago. I’ve never heard of the strips you mentioned. Now I’m ready to go buy some and dig out my layer pans. I think I have three 8” and two 9”. Just don’t know where they’re hiding after all these years. Will let you know how it turns out. I am anxious for the second half of the recipe so I can try it. I’m also anticipating the salt rising bread recipe. I haven’t had it since I was a teenager. Question, what does sour cream do for the cake? My husband can’t have that, is there anything I could substitute for it? Loved your newsletter today. No, I didn’t see it coming. Thought it was something else though. Not putting any details in this because I want others to read and enjoy. The butter cake sounds great. I will have to make it soon. Have a great day. My son has been raving about a delicious, kind of ‘dense’, yellow colored cake he had for desert at a recent dinner theater performance he attended. He does not rave about deserts-only carrot cake! I wonder if this is what he had? Was actually going online today to look for it! Thank You, Thank You, Thank You! Now I do not have to search-I will definitely make this! Happy Monday! Hey Steve, Sounds great…I’m definitely going to try to make it.